I don't know about anyone else but I have seen Bondi Sands fake tan everywhere at the moment. In adverts, magazines and just everywhere with people raving about how good it is. I've never really been a fake tan girl. I used to occasionally use the Dove gradual tan one which I did like but I got sick an tired of the orange streaky marks where I was just wasn't very good at applying it evenly. But I have never ever used a full on fake tan or been for a spray tan before in my life so I was very very nervous about this. Butttt its everywhere and in the last few of my posts I have really noticed how pale I look so was determined to give it a go. And I love it. It is honestly sooo bloody good! I did have a lil disaster but it was soon rectified and now I am all bronzed up and loving life. So first up they tell you to exfoliate so you have super smooth skin, but not to moisturise after that. What the instructions don't tell you on the bottle is that you should spray and then with a tanning mitt rub it into your skin (they have a little how to apply video which shows you this). I, on my first go did not do this. I ended up being a little patchy where it was held too close to my skin in areas blah blah but overall I think it went okay without the mitt - you just need to be aware of how far away you hold it. My boyfriend Ollie did help me out with this and we did have a laugh when we realised 1. just how patchy I was 2. that it was all his fault! and 3. that all the spray that didn't manage to reach my body ended up on the floor which I was treading on. So the soles of my feet had a super strong tan going on. It was not good ha! After this little my first trial and error attempt, I did it again a couple weeks later when the tan had all come off and this time it went much better! But even when I was patchy the colour was so good, very bronzey not orange at all so that's always a plus. I went for the light colour because I am quite pale and I didn't want the colour difference to be really badly obvious. Next time I head ff to buy it though I think Iight try the darker colour so it almost looks like a gradual build up. Here are some before and after pictures so you can see the results for yourself! I did have a bit of a t-shirt tan here too hence the darker little V shape on my chest! Overall I loved it, was very natural looking and it last for quite a long time - obviously slowly washing off every day but still was worth it! 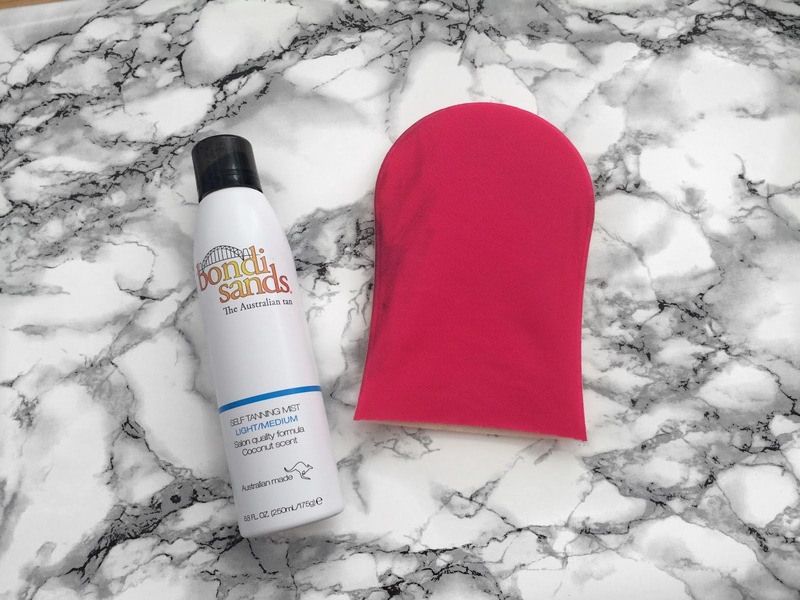 You can shop Bondi Sands here - its on offer at the moment so get buying if I have convinced you! Have you ever had a fake tan disaster like my patchy skin and feet? Share your stories and make me feel better about myself haha!